The 20th Annual Pacific Rim Whale Festival will take place this year March 13th to March 21st, to celebrate the annual spring migration of the gray whales along our West Coast. During those two weeks the districts of Tofino and Ucluelet along with Pacific Rim National Park Reserve will host over 70 events. Each spring, the population of the Pacific Gray Whale, estimated at 22,000, travel along the coast of Vancouver Island from Baja Mexico on their way to the Bering Sea. Along the West Coast of Vancouver Island whales travel close to the shoreline, providing excellent viewing opportunities from the rocky headlands along the outer coast of our waters. During the Pacific Rim Whale Festival, shore side Bushnell viewing stations will be set up in the area, including one at Amphitrite Point Lighthouse. 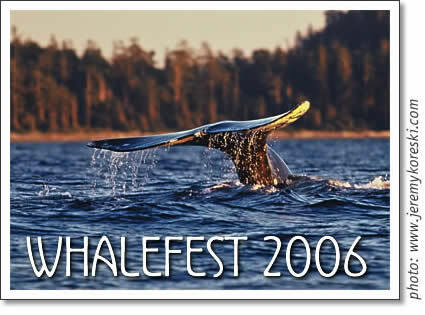 During the Pacific Rim Whale Festival, the hosting villages of Tofino and Ucluelet, along with Pacific Rim National Park Reserve offer a wide range of events providing entertaining and educational activities for all. Some highlights include: the Chowder Chow Down in Ucluelet - a seafood chowder cook-off competition guaranteed to whet your appetite and please the palate; the Parade of Whales in Tofino; to an amazing Art Show featuring the talents of our West Coast artists.